Drive-thru chapels, luxurious hotels, lavish ceremonies but above everything else, Las Vegas weddings spell fun! 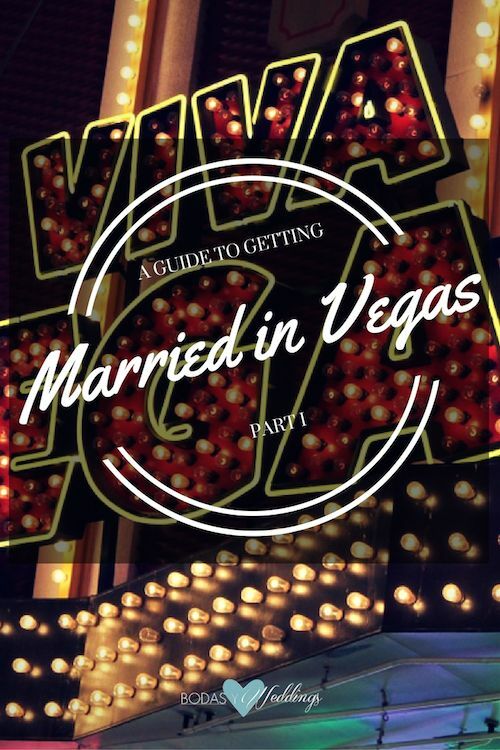 Let’s discover what getting married in Vegas could look like! 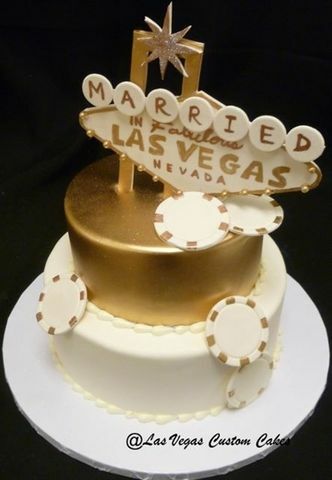 Poker chips, gold and fun on this wedding cake by Las Vegas custom cakes in Las Vegas, Nevada. From elopements to the full blown wedding affair, getting married in Vegas can turn any dream into a reality (yes, including getting married in Paris Vegas!). From the beauty of the Bellagio, the uniqueness of the Little White Chapel drive thru windows (includes tux rental on site), the opulence of the Cosmopolitan and the Wynn Hotels, the unsurmountable romantic environment of the Red Rocky Country Club, Sin City truly has it all. Yes! They are totally legit. Clark County, where Vegas is situated, issues thousands and thousands of marriage licenses each year. There are several things to consider when planning how to get married in Las Vegas. Yes, planning and Las Vegas weddings do belong in the same sentence! The first thing you will need to do is to apply for a marriage license. In order to get a marriage license in the state of Nevada you must be over the age of 18, and either be unmarried or legally divorced in the state of your marriage. You will be required to show proof of your age and eligibility for a new license. Bring a government issued photo ID, birth certificate or social security card, and paperwork showing your divorce decree if applicable. For those young lovers, you can marry in Vegas if you are under the age of 18. In this instance, you must have a guardian give consent in person at the time of application. 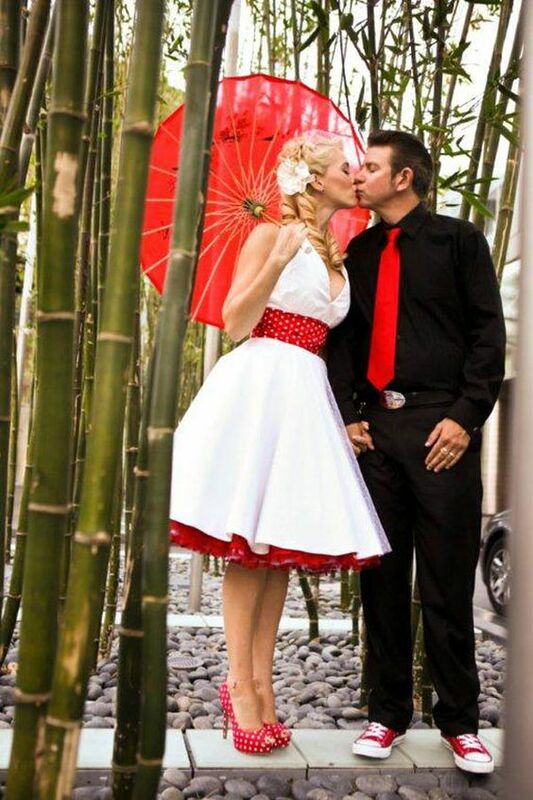 So much rockabilly on Las Vegas weddings. Red crinoline for her and matching chucks and tie for him, doesn’t it blow your mind? You can get started on the marriage license application online. Marriage licenses in Clark County do not require a blood test or a waiting period. This makes it easier to elope. The licenses are good for one year. And here is an interesting tip, the county office where licenses are issued is open 8 am to midnight 365 days a year! A dip at the Las Vegas sign. A must for your Las Vegas wedding photography. Do it at night when the lights are quite Vegas lit up. 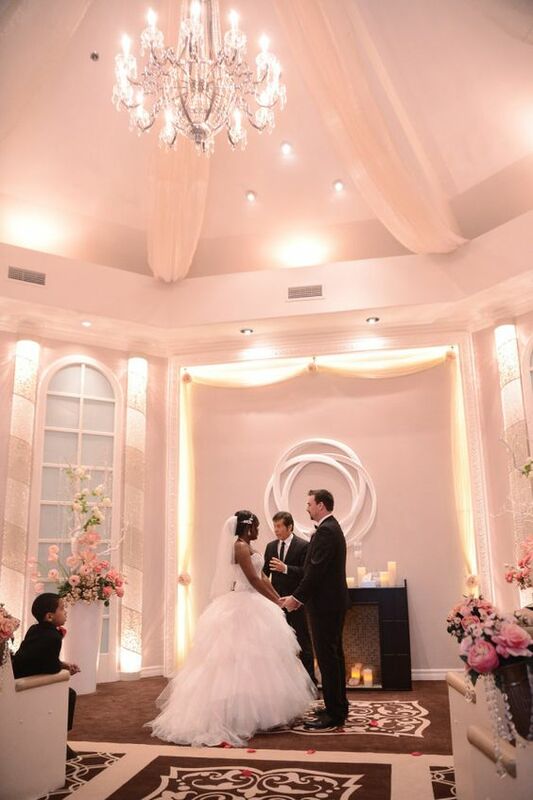 Photo credit: sceniclasvegasweddings. 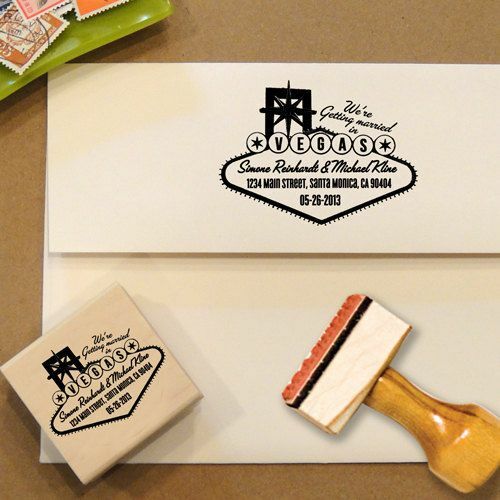 Address stamp for Las Vegas weddings sign, great for Save the Dates & wedding invitations. 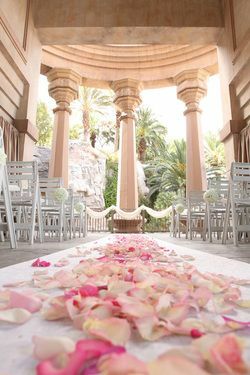 Las Vegas Weddings: Time To Pick A Chapel & A Hotel! 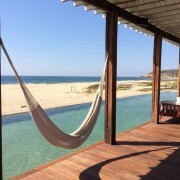 Now it is time to think about where to get married (or eloped) and where to stay. The only thing challenging about both decisions is which place to choose. 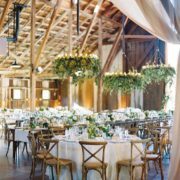 There are hundreds of wedding venues that include getting hitched by Elvis, locations with scenic views, the clerk’s office, glamorous hotels, and traditional churches. When in Vegas, you may get married in a helicopter, have a true western wedding on the edge of the Grand Canyon and so much more. This is a personal decision that you will need to base on your style, amenities, and price. A winery-inspired wedding at the Hilton Lake Las Vegas. Pick the theme of your dreams and head out to Vegas baby! 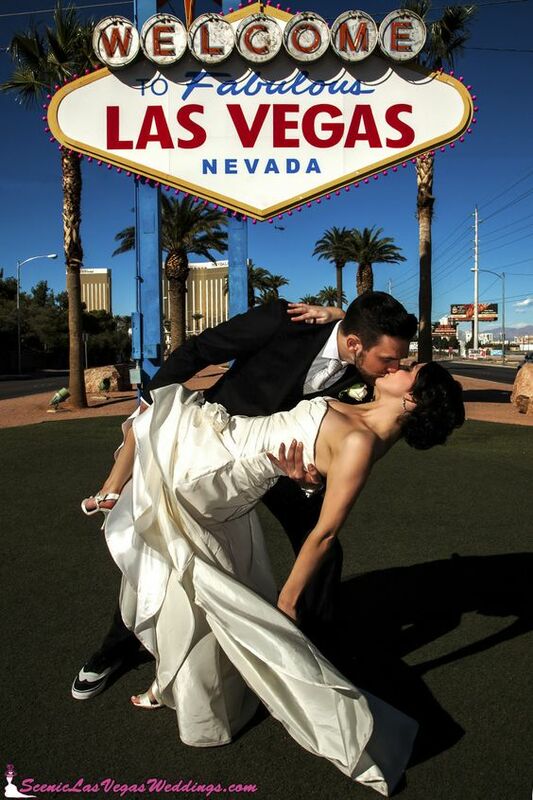 Get married in Las Vegas vintage-style. Photo credit: TSL Photography wedding photographer. To help you narrow down the choice of where to get married, here is a partial list of the best chapels to get married in Vegas. If your dream to be given away by the King, the Graceland Chapel (619 S Las Vegas Blvd, Las Vegas, NV 89101) is the place for you. They offer traditional Elvis wedding ceremonies and vow renewal services. Don’t forget the pink Cadillac rental to make it complete! The most adventurous couples will probably want to get married 1,000 ft above the Vegas strip with a 360 degree view in the Chapel in the Clouds (2000 S Las Vegas Blvd, Las Vegas, NV 89104) atop the Stratosphere Tower. A wedding that will never be forgotten! 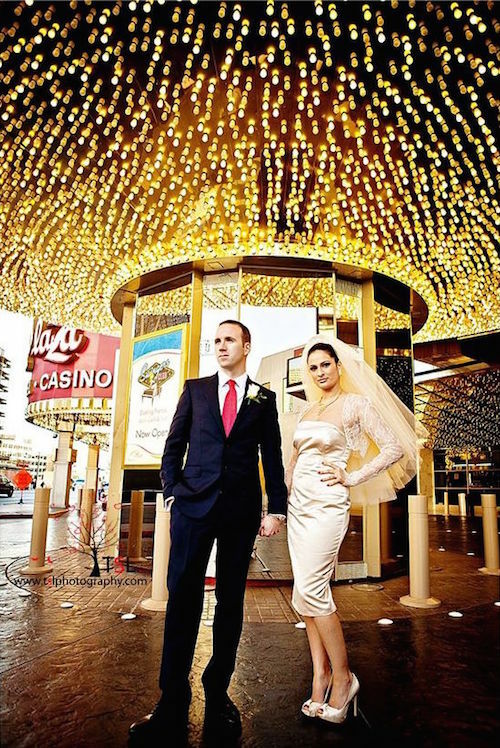 Las Vegas Strip elopement, the latest rage in weddings today! 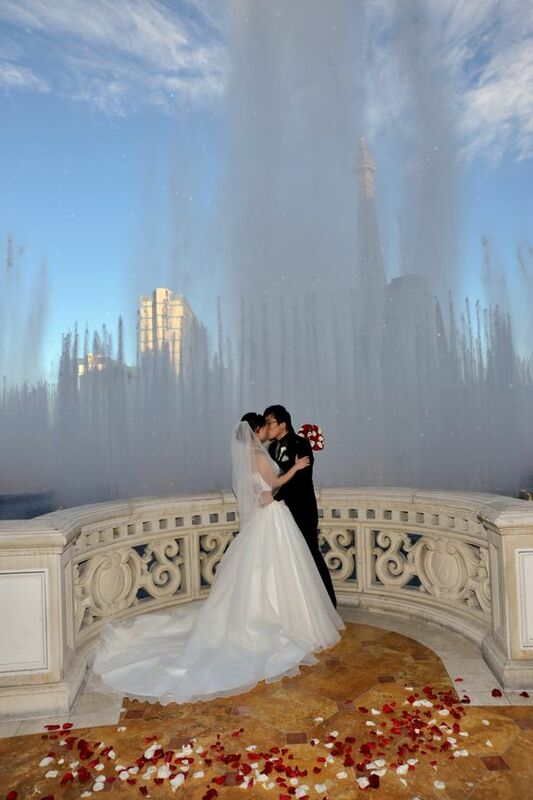 Photo Credit: exceedphotography Las Vegas Event and Wedding Photographer. 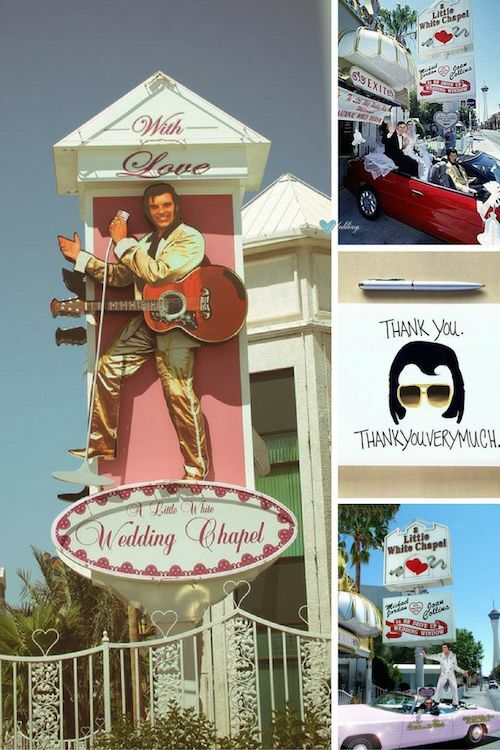 Located in the arts district of Las Vegas, Nevada, the Special Memory Wedding Chapel offers several options to get hitched in Sin City, the cheapest alternative being their famous drive-thru wedding that starts at US$199. The uniqueness of the Little White Chapel drive thru windows includes tux rental on site. Thank You Cards for Las Vegas weddings. According to Wikipedia, The Little Church of the West “is a wedding chapel on the Las Vegas Strip in Las Vegas, Nevada that is listed on the United States National Register of Historic Places.” They opened in 1942, Elvis Presley and Ann-Margret got married here in the movie “Viva Las Vegas” but the Chapel has also witnessed the weddings of Richard Gere and Cindy Crawford, Billy Bob Thornton and Angelina Jolie and so many more. Not bad as the backdrop for the most memorable elopement, right? Stunning red, white and very rockabilly wedding at the Little Church of the West in Las Vegas photographed by Vitamin C.
Viva Las Vegas, one of the best wedding chapels in Nevada, has 50 wedding themes to choose from that range from Elvis to the vampires, pirates, gladiators, and Old West among many others. We are sure you will find the theme that fits you best. Another Vegas wedding location, Mandalay Bay, an MGM Resort with a classy high-end island feeling. You may also choose the Excalibur for a renaissance experience in Las Vegas weddings. 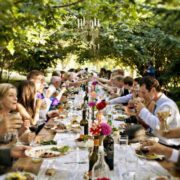 For those that have more of the traditional reception in mind, there are a plethora of choices both on the Vegas strip and off the beaten path. Hot pink wedding at the Flamingo Las Vegas Chapel from Bently and Wilson Photography Little Vegas Wedding. If you dreamt of getting married in the city of lights but your wedding budget does not allow it, Vegas offers you choices. Get transported to France at the French-themed hotel and casino Paris Las Vegas to the magnificent Eiffel Tower. 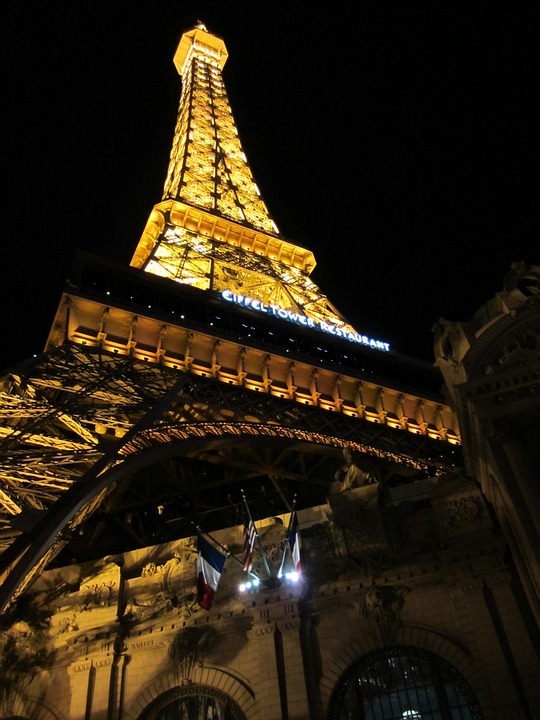 Get transported to France at the French-themed hotel and casino Paris Las Vegas to the magnificent Eiffel Tower. With nearly 300 hotel options in Vegas, and some of the hotels have chapels, the only way to narrow down your options is to make of list of items that are important to you. After-Party Las Vegas-Style or Traditional Wedding Reception? And finally the last decision to make is what to do after your Sin-City wedding. 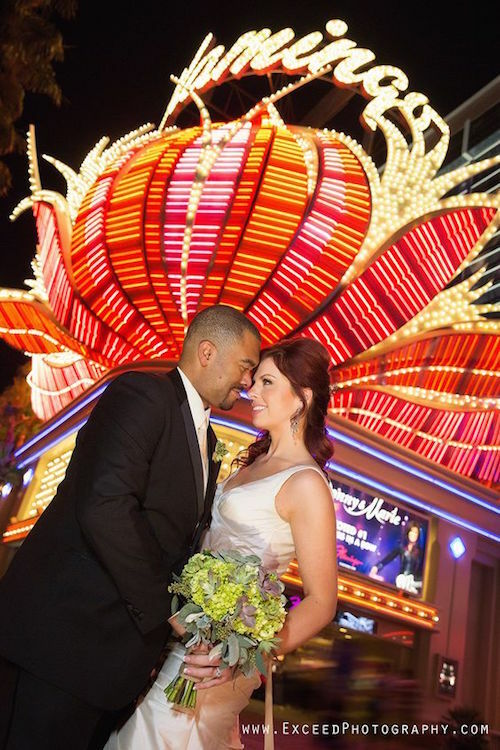 Do you party it up Las Vegas Style, or have a more traditional reception? For those couples going the elopement route, very on-trend right now, a Vegas after party might make the most sense so you can skip the planning details and just spend time with your sweetie and closest friends. For those that have more of the traditional reception in mind, there are a plethora of choices both on the Vegas strip and off the beaten path. 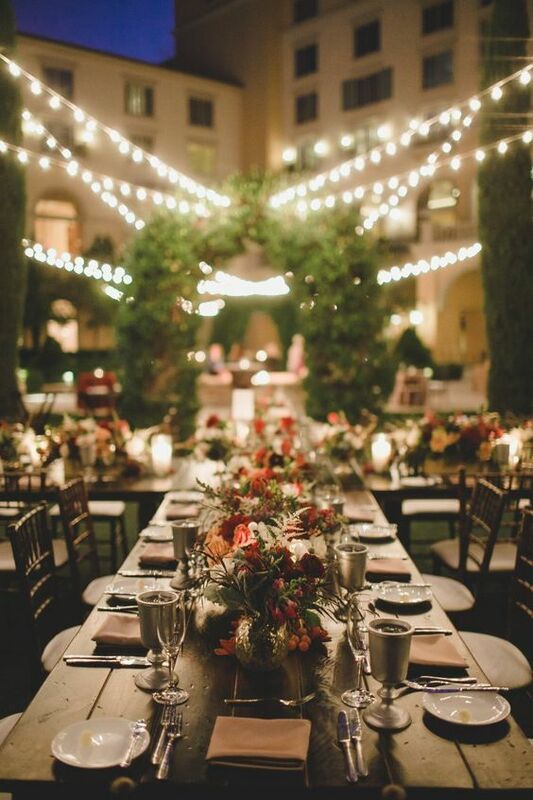 Reception venues include country clubs, art galleries, rooftop venues, banquet halls, outdoor venues, mansions, gardens and anything else you can dream up! Dice made out of white boxes. 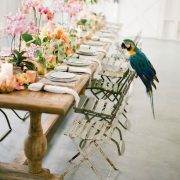 great idea for centerpieces too! A perfect way to display your utensils for Las Vegas Casino themed pool party. 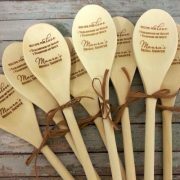 Fun guest favor idea if your reception will be at or near a casino! 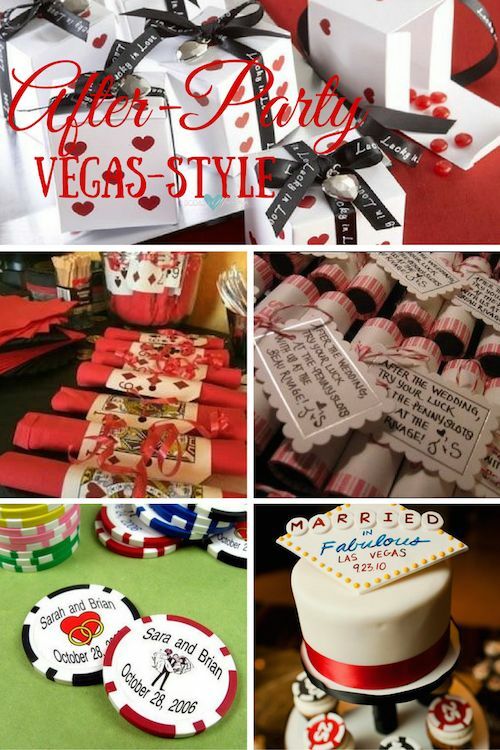 Your guests will not leave with empty pockets when you give them personalized poker chips wedding favors. A Vegas wedding cannot miss its wedding cake. Do you think you could play one of the cupcakes at the roulette tables? Las Vegas wedding at The Palms, by Chrisman Studios. 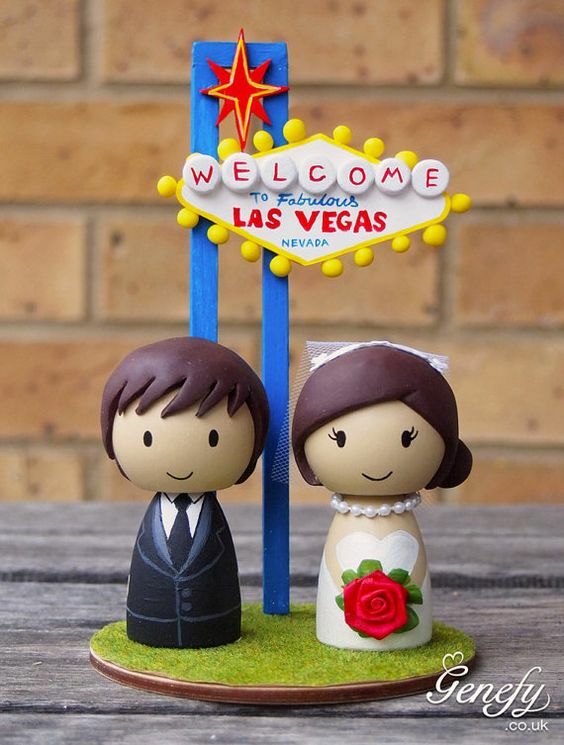 Las Vegas weddings cake toppers are awesome! 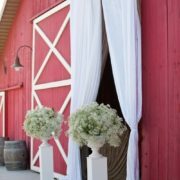 Here are a few places you may want to check out and incorporate into your wedding celebration to make it, if possible, even more unique. The Mob Museum, the Neon Museum, the Flamingo Hotel, the Caesar’s Palace. The Artisan Hotel, the oh-so-famous Golden Nugget Hotel & Casino, The Mirage Hotel (featuring a dolphin habitat), the Fremont Street experience and the Heart Attack Grill where diners don hospital gowns before indulging in heart attack-inducing fare such as the bypass burger. This is what I would call build your Bloody Mary. Not only do you have a choice of premium vodkas, you can have them infused with flavor – like bacon – and the toppings are out of this world. 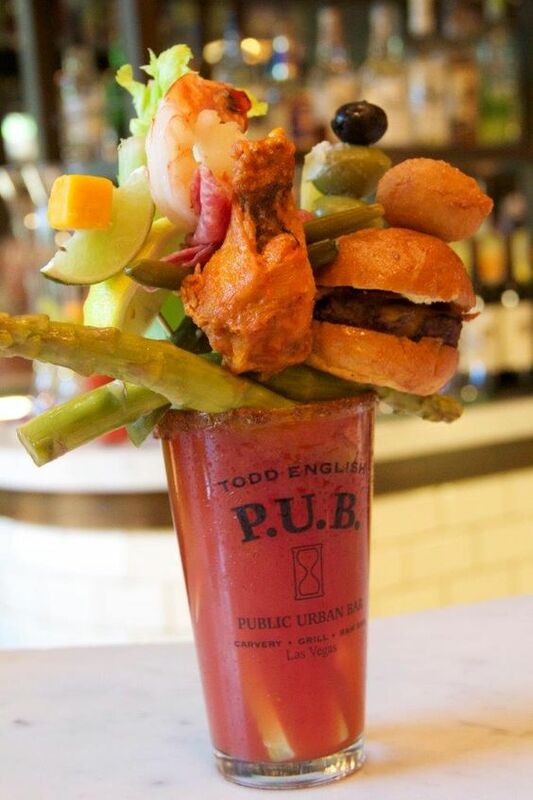 Todd English Pub at Las Vegas. With more than 300 sunny days each year (and a whole lotta booze) it’s no surprise Las Vegas is known as the ‘wedding capital of the world’. Bellagio Las Vegas weddings. No matter whether you choose a Vegas-style after party or a traditional reception, with so many unique options, it is bound to be a day you’ll never forget! From elopements to the full blown wedding affair, getting married in Vegas can turn any dream into a reality. Las Vegas weddings place cards. ‘Bet on Love’ bridal bouquet. Casino dice Las Vegas theme favor boxes. 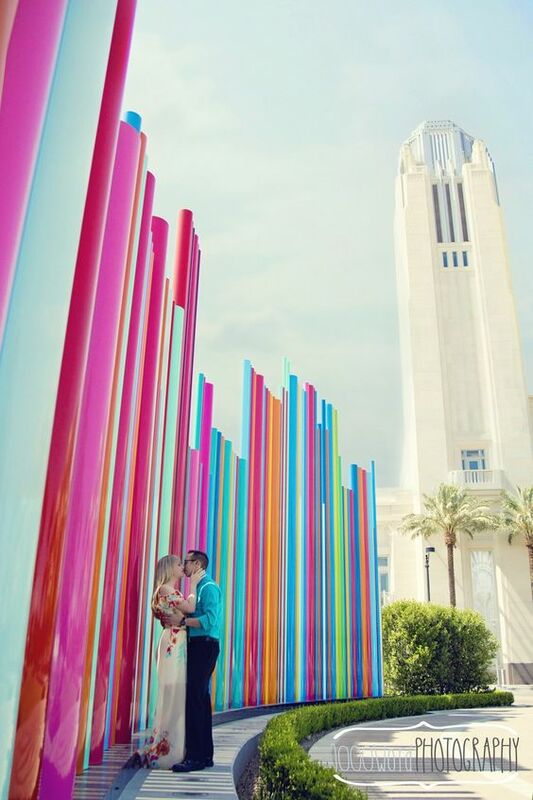 A cute engagement against the colorful backdrop of The Smith Center by 1000 Word Photography via Little Vegas Weddings. 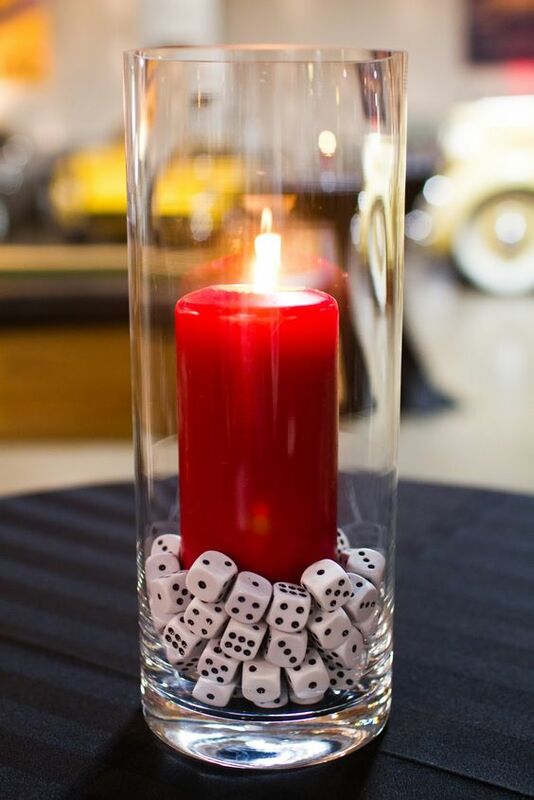 Lady luck will be on your side with these Sin City-themed original wedding centerpieces designed by Every Little Detail Event Planning and Design. Love the wedding set, the map idea with the rings, and also the location. Let’s start with this Las Vegas engagement pic and let’s discover what getting married in Vegas could look like! Las Vegas wedding invitations in black, white and gold glitter in pocket fold style.